On July 8, 2011, the Atlantis space shuttle took off for its last flight, as the last space launch on American soil, and on July 21, the space age hit a crossroads. Ever since, America has been launching astronauts to the I.S.S. (International Space Station) with the help of Russia, using their rockets. Then in 2017, SpaceX was elected to build a spacecraft to carry astronauts to the I.S.S. , so what the catch? This shuttle will be launched off of American soil from the Kennedy Space Center for the first time in eight years. 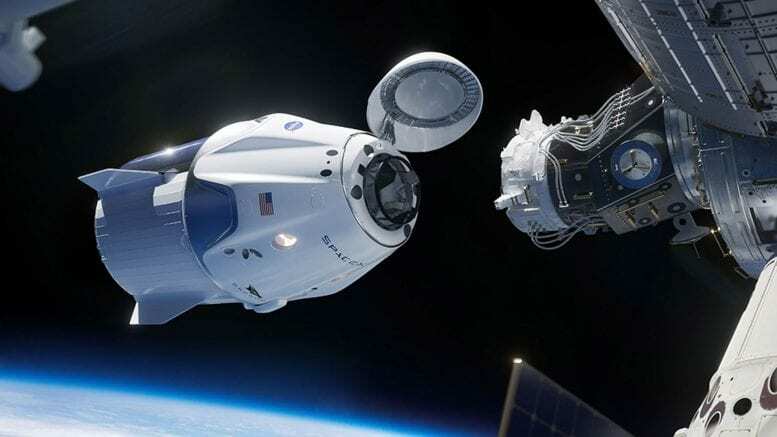 Tests had happened, an unmanned test flight had succeeded and the crew dragon capsule had safely landed in the Atlantic Ocean. And on March 3, the mission, manned by Bob Behnken and Doug Hurley, successfully docked with the I.S.S. .
On March 8, they undocked and completed their splash down. This was a big feat for SpaceX, because of their debated idea of load and go. Load and go is when the crew is loaded on the ship and then the rocket is fueled quickly; the problem is that the cold hydrogen fuel, which makes the rocket perform better, must be used as quickly as possible after fueling process. The problem is, fueling is dangerous and many mistakes have been made. This time however- success! A great feat conquered, a debate as usual, a budding crew. Be the first to comment on "The First Manned Mission to Launch Off of American Soil Since 2011"